Congress, through the two-month payroll tax extension approved December 21, demanded the Obama Administration decide whether to move forward with the 1,700-mile Keystone XL Dirty Oil Sands Pipeline. Mr. Obama told them no, well, not until the re-application is received after the election. While maybe a bit of politicking, we require a different answer to our present and future energy needs: A Clean, Renewable, and Sustainable Energy Policy. Projected to cross the middle of North America, bisecting eminent-domain-acquired farmland and open range, the Keystone XL would skip over rivers and streams and the Ogallala Aquifer, from Hardisty, Alberta, Canada, to Port Arthur Texas. Considering the route has been altered since last November, avoiding some of the most sensitive habitats in the Sand Hills of Nebraska, environmental documentation has already begun, as required by the National Environmental Policy Act. Based on environmental and economic assessments to date, the Administration will have no basis to greenlight the Canadian Oil Sands Project on scientific grounds at any time in the future. Yet when it returns, all they must rule is whether the project is in the interest of the United States of America. Easy decision, right? An Oil Industry Hungry, Generous with Political Walking Around Money. 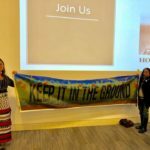 Analysts have posited (http://bit.ly/AtkOwl) that regardless of President Obama’s decision, the Keystone XL Pipeline, carrying the diluted bitumen sludge crude mined in-situ and open pit from the Florida-sized Boreal Forest of Alberta, will not go away any time soon. And lo and behold, Obama is now stumping for the southern leg from Cushing, Oklahoma to Port Arthur, Texas. The multinational oil companies hungering for profits and world oil markets thirsty for product will find a way to transport this pipeline-corroding dil-bit, only occasionally leaking into the great Ogallala (They tell us 12 times in a year is not so bad). The product will be Texas-processed and shipped China-ways or to the local gasolinera, to be burned in our internal combustion engines idling in the driveway, speeding and stopping on traffic-choked twelve-lane freeways. Local and national politicians will continue to check their mailboxes for contributions marked “Citizens United Monopoly Money” and the vote will tend toward destruction. Is this in our National Interest? Climate Instability Continues Because Big Oil Scientists Don’t Read the Weather Report. The breeze will smell like greenhouse gases, Canadian “ethical” sludge almost three-times richer in carbon soot than regular “unethical” Saudi crude. Joplin, Missouri, will permanently prepare for tornadoes. New Orleans and the Carolinas will remain on hurricane watch. The drought in the Southwest, drying of the Colorado River and its reserve called Lake Mead, will inspire battles between sprinklered-golf-course-addicted cities: you know who you are. The whitebark pine forests of Yellowstone will warmly rust amid the melt-water, and then begin to burn during the hot summer heat. LA residents will continue to eschew rail and buses because a real “American” drives a big car, while suburban workers will take out loans to service their fossil fuel addiction. Will the Big Banks concur? Is this in our National Interest? Canadian Environmental Crimes Committed So We Can Drive to a Hamburger Joint? Water laden with toxic bitumen-wash tailings seeps into the downriver flow toward the Canadian Peace-Athabascan Delta, air-plumes of particulates will sweep over the indigenous citizens and the millions of migrating birds, buffalo, and caribou. Explosions ring out around the 50 square miles of tailing ponds, water used to wash the crude from the forest sand, then left to settle for decades. Poisonings will abound as long as people eat fish, hunt game, and drink water. The Alberta governmental officials assure us the oil companies will restore the landscape to an even healthier ecosystem…someday. Is this in our National or International Interest? Jobs and Investiture, Houses of Cards. Are 6,500 employment opportunities from a pipeline, most temporary and non-local, worth this destruction? TransCanada references billions of dollars invested in the US economy to build this project? Really? Where? What if we invested billions into rooftop innovative-film solar, vertical-vortex-wind turbines within existing high-tension transmission lines, and advanced biofuel technologies generated from wastewater treatment and solid waste? These would be jobs the earth could support. Billions invested into intra-state high speed rail, dedicated bus rapid transit lanes, and suburban light-rail projects with associated transit-oriented development at stations? We could reshape our cities for a cleaner and leaner tomorrow…and survive to take a stroll to the park with the kids. Aren’t these options more in our national interest?